Cave Rock is a sacred Washoe Indian site above the shores of Lake Tahoe, Nevada. There has been much controversy and strife surrounding the past and present uses of this area. Many legends exist and people often see images in the rocks. 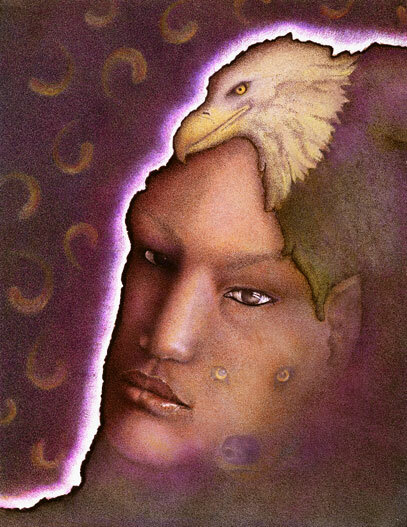 The outer edge of the woman and the eagle in the illustration is the actual shape of Cave Rock. The other parts of the image spring from geological shapes that exist in the rock itself. The original illustration is 7.5"x9.5" and was created with acrylic, pen and ink, and colored pencil.